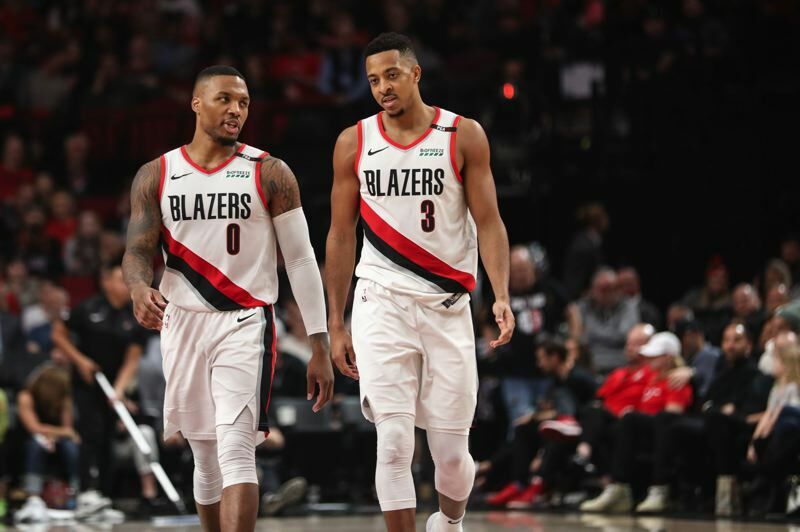 • When I asked Damian Lillard about the Blazers 10 games into the season after Sunday's 111-81 laugher against Minnesota, Portland's All-Star point guard said this: "I'm sure people didn't expect us to be where we are now." I'm not so sure about that. Portland's victories have come at home against the L.A. Lakers, San Antonio, New Orleans (without Anthony Davis) and Minnesota and on the road against Orlando, Indiana and Houston (without James Harden). The losses came at home against Washington and in a return match with the Lakers, and on the road at Miami. "We should have won the Wizards game," Lillard says. "We had a bad stretch against the Lakers, but we felt we should have won that game. We didn't play well against Miami, but we gave ourselves a chance to win down the stretch. "We've played good basketball. We've been pretty consistent with the things we need to do to win games, and it's showing." I'd say the Blazers are about where you'd expect them to be. They shouldn't have lost to the 2-7 Wizards, but everything else matches up. Lillard says Portland has the toughest schedule in the NBA the first 40 games. I don't know about that, but the next couple of weeks are challenging. There are visits from Milwaukee, the L.A. Clippers and Boston to Moda Center before embarking on a six-game road trip, which ends with games against the Bucks and Golden State Warriors. If the Blazers get through that nine-game stretch 6-3, they would be in good shape. A 5-4 mark would be suitable; anything less would be a disappointment. • Portland entered Sunday ranked third in the NBA in offensive efficiency and 10th in defensive efficiency. Only once during the Terry Stotts era have the Blazers finished a regular season in the top 10 in both categories — in 2013-14. The Blazers' offense is one of the best in the league. They rank sixth in scoring (117.2), 10th in field-goal percentage (.465) and 3-point percentage (.356) and first in free-throw percentage (.861). Portland ranks eighth in opponents' field-goal percentage (.426) and 11th in opponents' 3-point percentage (.328), yet it seems as if the Blazers still need to be better at the defensive end. "I still think (Jusuf Nurkic) can have a little more of a presence at the rim," Stotts says. And frankly, several opponents have just missed a lot of open shots from 3-point range against the Blazers. We'll know more after they face teams such as Milwaukee, Boston and Golden State over the next 2 1/2 weeks. • Lillard is off to a sensational start offensively, ranking fifth in the NBA in scoring (28.1) and free-throw percentage (.938) while shooting .478 from the field and .370 from 3-point range. CJ McCollum's numbers aren't quite up to last year's; he is averaging 18.9 points while shooting .429 from the field, .345 on 3-point attempts and .829 at the line. Stotts is playing McCollum and Lillard more minutes together, "which affects how much the ball is in (McCollum's) hands," the coach says. "He is getting a decent amount of shots. His numbers are down a little bit, but the emphasis this year is in passing and incorporating the team more and (creating) less off the dribble." • Don't underestimate the value of having a great free-throw shooting club. "It's an advantage when you make your free throws," Stotts says. "At the end of a close game, it's important. I've been with good free-throw shooting teams, especially in Dallas (as an assistant coach). You end up taking it for granted, but it makes a big difference. And when you have guys like Damian and CJ shooting most of them, you have a tendency to be better as a team." The Blazers have a full team of foul shooters. Meyers Leonard is 11 for 11 — and when you're shooting as few as he does, that's remarkable. Al-Farouq Aminu (.895) and Zach Collins (.821) are excellent, and Nurkic (.775) has improved. Only Evan Turner — who shot .850 a year ago — is struggling at .667. • Nurkic is averaging a double-double — 15.3 points and 10.1 rebounds — despite playing only 24.8 minutes per game. Nurkic's playing time "depends on how the game goes," Stotts says. "Zach closed out the first couple of games. Sometimes it's been foul trouble. Some teams have gone small, which has affected (Nurkic's) time. At Indiana, Caleb (Swanigan) and Zach played well. Our front line is fluid right now." • Portland's bench is one of the best in the league. The two free-agent acquisitions, guards Nik Stauskas and Seth Curry, have provided scoring and 3-point shooting. Collins and Turner have been outstanding. "Our starters are playing solid and our bench is playing consistently," Lillard says. "We have so many different guys pitching in. Our balance is our strength." "Their backcourt is dynamic. (Lillard and McCollum) play great off of each other. Their shooting range makes them special, but they're both great off the dribble, also. When you add Turner to the mix and he handles the ball, then you have to defend Damian both ways — as a point guard and a shooting guard. That poses a different problem. The shooting they've added makes their bench really dangerous, and Zach Collins has vastly improved from a year ago." • NOTES ON THE MINNESOTA GAME: The Timberwolves were without guards Jimmy Butler (precautionary rest), Jeff Teague (knee) and Derrick Rose (ankle). That left Josh Okogie, Tyus Jones, Jared Terrell and C.J. Williams to match talents with Lillard, McCollum, Stauskas and Curry. Not a fair fight. ... On the other hand, Portland ruled the boards 66-38, which had little to do with Minnesota's missing backcourt. ... Leonard had played only 46 minutes in the first nine games, but Stotts went to him early against the Timberwolves, and the veteran 7-footer responded with 10 points and five rebounds in the first half. Leonard finished with 15 points and 12 boards in 22 minutes, going 3 for 7 from the field and 8 for 8 from the line. "I was just out there having fun, playing hard," he said. "I didn't shoot the ball well, but my teammates were looking for me. I got some offensive rebounds and made my free throws." Leonard also got into it with Minnesota reserve James Nunnally, drawing an offensive foul, then dunking emphatically over the Timberwolves reserve. Leonard was also tagged with a technical foul on the play. "There was no intention to disrespect (Nunnally) whatsoever," Leonard said. "I was just out there competing. (Officials) said I stepped over (Nunnally). Maybe I did. I was a little frustrated with the (personal foul) call. I didn't think I bumped him too hard. But I always respect the officials." Leonard was serenaded with "Meyers! Leonard!" chants after that. "I think that's the first time ever, so I guess that's cool," said Leonard, an object of derision from fans at times during his seven seasons with the Blazers. ... Stauskas left the game after a collision with Minnesota's Gorgui Dieng at the end of the third quarter and did not return. "His knee clipped over the top of my thigh muscle and I got a charley horse," says Stauskas, who hopes to be available for Tuesday's matchup with Milwaukee.... With his father, Gary Trent, looking on from the crowd, rookie Gary Trent Jr. got his first NBA action, going 1 for 4 and scoring two points in seven mop-up minutes. Trent air-balled his first attempt — a jumper from the foul line — but scored on a twisting layup moments later. "It was exciting to finally get on the court," Trent Jr says. "I enjoyed every moment of it." • ON THE MILWAUKEE GAME: The Bucks are 8-1 after trampling the Kings 144-109 at Sacramento on Sunday and have a rising star in 6-11 Giannis Antetekounmpo, who is averaging 26.1 points, 13.7 rebounds and 5.1 assists. "He's right up at the top of the league's best players," Lillard said. "I don't think you can argue with that, with how hard he works, how his body looks now compared to how he looked when he first came into the league, how his game has grown. He has taken command of that team. He's their guy. Now they have shooters around him and they're making 3's. They're tough to deal with. They're one of the top teams in the league, because of him and his growth and his improvement. For us, it's an opportunity to show teams that, when they come in here, they have to earn it. We're ready for a tough game."